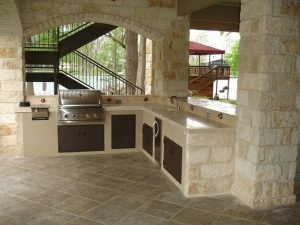 Divine Design outdoor kitchens are fabulous; we specialize in the design and installation of fully customized outdoor kitchens and barbecue areas. When we dream of our ideal home our only limits are our imagination, Divine Design are specialists in realizing the dreams of our clients. The outdoors removes the confines of space that a typical kitchen might have, in that sense, we can go beyond the usual barbecue, any type of cooking is possible. From Outdoor Pizza Ovens to Gas Cookers to the materials and quality you expect from Divine Design. Keeping in mind the surroundings, it is necessary to analyze all the characteristics of your outdoor space. The orientation of trees to allow for the proper shade or other buildings might determine individual designs. Spend more hours in the garden enjoying the outdoors, your home and the outdoors might seem like two different worlds today, but Divine Design can join them and bring harmony and continuity. An elegant and modern design that departs from traditional concepts. At Divine Design we offer tailor-made designs and custom outdoor kitchens and Barbecues for gardens, putting greens, corporate or residential spaces… The comfort of your home in the great outdoors. Give us a call today, let us come out and measure your space for free… We can work with any budget.